With three operational squadrons, I felt it was a good time to take a deeper look at the JF-17 Thunder, the Pakistan Air Force (PAF)’s new backbone fighter. Since the first prototype’s rollout in 2003, I was immersed in following the fine details of the program, but I never properly understood or appreciated the actual high-level value of the JF-17 to the PAF. While the technical details are important (and I will study them in future articles), it is equally important to understand the strategic value of the program, i.e. the protection and flexibility it affords the PAF against sanctions. Not only that, but as an owner of the JF-17 program, the PAF has the freedom to set the JF-17’s upgrade path according to its own needs and objectives. Combined, I believe these two aspects of the JF-17 make this program a true game-changer for the PAF on a number of levels: These include enhanced operational efficiency, improved defensive and offensive capability, and strengthened confidence in a scenario of international tension. I will not be able to cover all of these aspects within a single article, but I will start with the broadest aspect, the point where the JF-17 is a stimulant for greater confidence on the part of the PAF and Pakistan’s defence planners, especially in times of crises. Whether it be wars with its rival India or periods of not-so-great relations with the U.S, the PAF has often suffered as a result of military embargoes. Other than Pakistan’s poorly managed economic affairs, sanctions have without doubt been the biggest culprit to the qualitative and quantitative gap now exhibited between the PAF and its primary adversary, the Indian Air Force (IAF). At no point was this more apparent during the 1965 Indo-Pak War and in the 1990s. In 1965, Pakistan’s decision to militarily engage with India over Kashmir (starting first with Operation Gibraltar – the Pakistan Army’s failed attempt to wrestle away the region via low-intensity war) was not viewed in positive light by the U.S, Pakistan’s main patron of financial and military support until that point. With its 100% American-built fighter fleet cut-off from a steady supply of spare parts and attrition replacements, the PAF’s medium to long-term capacity to fight was cut down. The F-104 Starfighter was one of the PAF’s marquee aircraft during the 1965 War. In the 1990s, Pakistan was on the receiving end of the Pressler Amendment, a piece of American legislation designed to stop the Pakistani military from developing nuclear weapons. 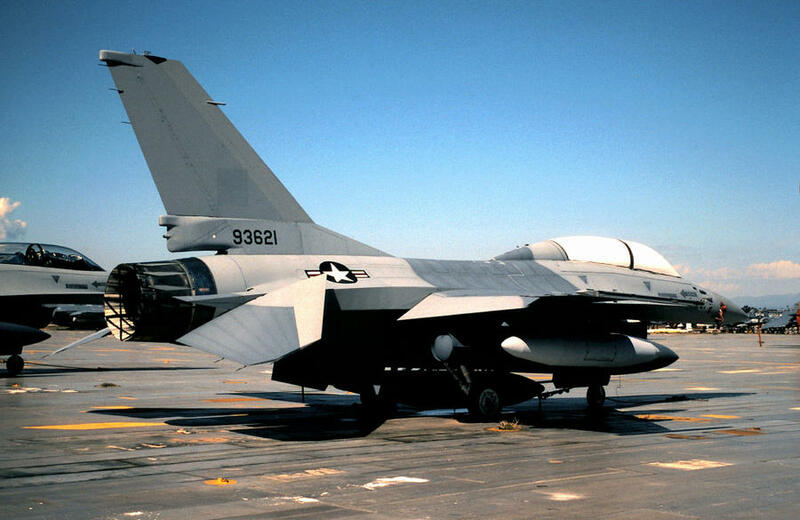 In 1988-1989 the Pakistan Air Force had hoped to build a substantial portion of its operational fleet around the F-16A/B, but Pressler made Pakistan’s abandonment of its nuclear program a prerequisite to the delivery of those aircraft. 28 of the 71 ordered F-16s were built, and until the early 2000s, they had been kept in storage in the U.S. The U.S Air Force (USAF) and U.S Navy took ownership of them, with the latter using them as aggressor aircraft for training. The 14 USAF aircraft were eventually delivered to the PAF as part of George Bush Jr’s efforts to win over the Pakistani military’s support in the War on Terror. But in the interim period the PAF had to acquire surplus Mirage III and V aircraft from Australia and France as a means to help soothe the gap left by the non-delivered F-16A/Bs. And while it did try to acquire the Mirage 2000 from France in lieu of the F-16s, public corruption and poor public finances caused those efforts to collapse. One of the embargoed PAF F-16s that was assigned to the U.S Air Force, this unit was later transferred to Pakistan. 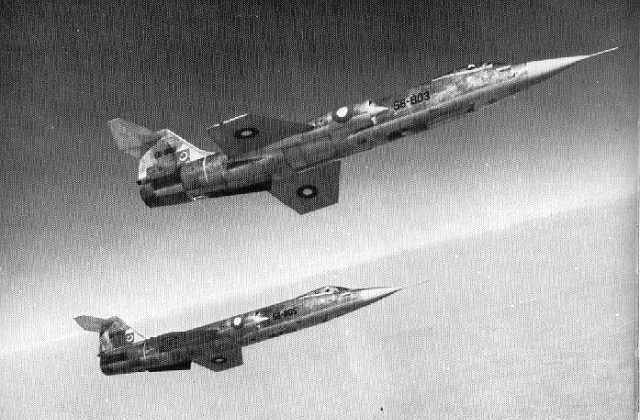 Although the idea of manufacturing modern jet fighters in Pakistan was explored since as far back as the 1950s, the notion gained serious momentum in the late 1980s when the Sabre II program was studied. At that time the PAF was looking to replace its ageing F-6s (Chinese variant of the Soviet MiG-19) with a modern low-cost multirole fighter. The idea basically revolved around taking the Chinese F-7M (a MiG-21 variant) and heavily modifying it to fit a Pratt & Whitney or General Electric turbofan engine and a powerful radar (reportedly the AN/APG-66, i.e. the radar used on the F-16 at the time). A render of the Sabre-II program. The PAF requested Grumman to come up with a design using the Chengdu F-7M as the basis. The Sabre II was envisaged as a collaboration between the PAF, Chengdu Aircraft Corporation (CAC) and Grumman Aerospace. It was hoped that the U.S would supply the turbofan engine, radar and avionics suite. In the end the project was canned, primarily as a result of U.S sanctions, but also potentially the reality that the design might have been too limited for long-term use. At the end of the day the Sabre II was still based on the F-7, which in turn is a variant of the 1950s-era MiG-21. But with the Pressler-sanctions taking their toll on the PAF’s F-16 fleet and cutting the PAF from acquiring spare parts and attrition replacements for its most modern fighter, urgency for a locally-sourced fighter became critical. In 1994 the PAF accepted an offer from the China National Aero-Technology Import and Export Corporation (CATIC) to jointly-develop a new lightweight multirole fighter, then known as the Super-7. The Super-7’s design was finalized in 1999, and sometime later, it was decided by the PAF to decouple the program’s airframe development from the development of its electronics (e.g. radar). This was a significant change in that the development of avionics or radars was no longer dependent on the airframe, and vice-versa. This helped keep matters fluid in that should a new kind of system were to arise on the electronics front (where the industry moves quickly), the PAF could readily incorporate those shifts onto the platform without a major lag time. This helped ensure that the final product would be in line with the expectations of the day it rolls out, not the day when it is finalized on the drawing board. A mock-up of the Super-7 released some time after the design was finalized in 1999. The selected engine was the Klimov RD-93 from Russia, a variant of the RD-33 used on the MiG-29. The PAF was and still is satisfied with its choice, and it may hope that this avenue will continue by including the more powerful RD-93MA. Western turbofans were considered, but the risk of sanctions and reality of weak public finances on Pakistan’s part must have firmly excluded those routes. China is also developing its own engines for the fighter, most notably the WS-13 (and possibly WS-17 if is indeed a different program from the WS-13), but I doubt the PAF would select them when it can still acquire the RD-93. The first prototype rolled out and flew in 2003, and the Super-7 was given a new name – JF-17 Thunder. Since then the fighter had seen a few significant changes to its airframe. I will explore these changes in greater detail in another article, but in short, the JF-17’s airframe saw numerous aerodynamic improvements, most notably to the leading edge root extensions (LERX) and air intakes. Actual production-batch JF-17s. Notice the altered intakes. The final electronics suite (i.e. radar, avionics, EW/ECM, etc.) was drawn from Chinese vendors such as the Nanjing Research Institute of Electronics Technology (NRIET). I will go into the specifics of each current (and future) subsystem in a subsequent article, but needless to say, the JF-17 Block-I currently in service with the PAF is equipped with a modern radar and avionics suite. Since its induction with the No. 26 squadron in February 2010, the JF-17 has (alongside the new and upgraded F-16s) infused the PAF with greatly improved air-to-air (A2A) and air-to-surface (A2S) combat capabilities. 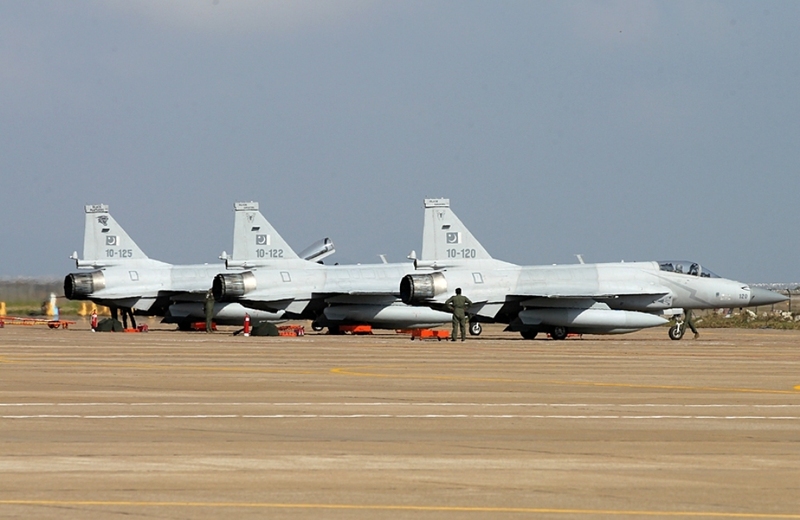 With 54 JF-17s in service across three squadrons the PAF is on-track to meeting its requirement for 150-200 aircraft. Production is shared between the Pakistan Aeronautical Complex (PAC) in Kamra and CAC in Chengdu. Under the original workshare agreement, PAC produces 58% of the airframe, with the remainder imported from China. At present the PAC’s annual rollout rate is set to 16 aircraft (i.e. a squadron), but the facility reportedly has the capacity to produce 25 fighters per year. One may feel tempted to compare the JF-17 to its contemporaries, particularly the Indian Tejas and the JAS-39 Gripen. While there is definitely a place for such assessments, I am more inclined (in this piece especially) to evaluate the JF-17 on its own merits, specifically in terms of whether it substantively improves the combat capabilities of the PAF. One of the subtle notions of localization, especially in the case of a financially-strained country such as Pakistan, is that it does not translate into a genuine improvement compared to imported solutions. Some may be inclined to argue that the PAF would have ultimately been better off importing a large number of surplus F-16s, new J-10s and/or (if we really want to stretch the imagination) surplus Mirage 2000-5/-9s. While the theory is sound, especially as we are talking about mature and trusted platforms that beat the JF-17 on range, payload and electronics (especially in terms of radar and ECM/EW suites), the idea rests on a few assumptions. The first assumption is that the PAF would always have access to spare-parts and attrition replacements, and while that may be true in times of stability, Pakistan is never too far away from a situation or controversy that can threaten its supply of arms. The JF-17 addresses this problem by ensuring that the PAF can continue inducting modern aircraft in such times of crises. The second assumption is that the acquisition of imported platforms will enable the PAF to readily pair these platforms with the munitions of its choice. With the possible exception of the J-10B, it is highly unlikely that the PAF could readily integrate diversely-sourced stand-off air-to-surface munitions to a platform it does not own. Yes, France might be more willing to see the Ra’ad air-launched cruise missile (ALCM) on one of its current platforms, but there will always be some kind of friction, be it a technical hurdle, a commercial licensing issue, or (particularly in the case of the U.S) a supplier-side obstacle stemming from seller’s strategic needs and concerns. With the JF-17 the PAF is not limited to acquiring munitions from a single source nor is encumbered by restrictions set by an external supplier. 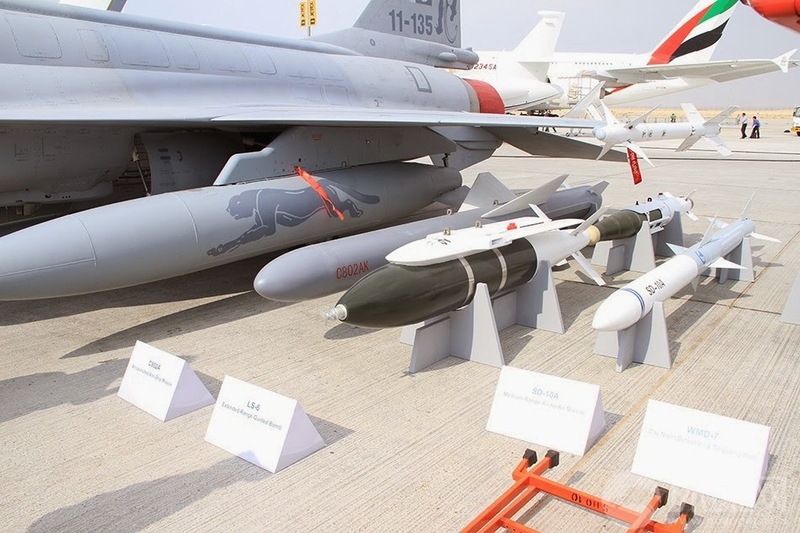 Through its ownership of the program, it can choose to equip the JF-17 with munition systems of its choice (based on what it can acquire and/or develop). Over the next 5-10 years (as the Block-II and Block-III JF-17s are inducted) we will see the PAF’s JF-17 fleet equipped with air-to-air and air-to-surface weapon systems from China, Brazil (Mectron MAR-1 anti-radiation missiles), the local industry (e.g. GIDS Takbir precision-guided-bomb kits), and potentially even South Africa (A-Darter high-off-bore-sight air-to-air missile) and Turkey. The advantage for the PAF is that it can readily pair the systems that are available to it commercially at-will to its backbone fighter. Not only that, but it can also build redundancy, e.g. 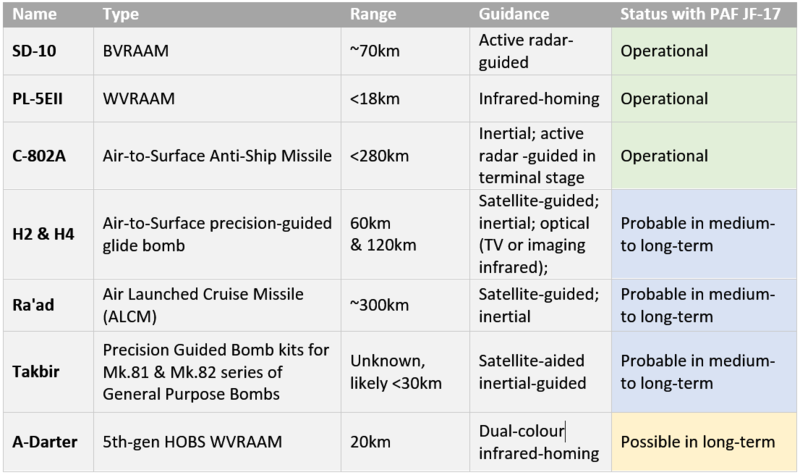 source beyond-visual-range air-to-air missiles (BVRAAM) from multiple suppliers, as opposed to limit itself to a single vendor, as is the case with the F-16 (which exclusively uses in the AIM-120C5 in the PAF). For my concluding point, astute readers may have picked up on something interesting within the details I discussed above. If you have not caught it, then know it is the point that the JF-17 can be equipped with many of the air-to-air and air-to-surface munitions found on more expensive fighters. Specific performance benchmarks aside, the JF-17’s various munitions can be as contemporary and forward-leaning as those found on say the JAS-39E/F Gripen. A good example of this is the A-Darter, a joint-program between South Africa’s Denel and Brazil’s Mectron to develop a high-off-bore-sight (HOBS) within-visual-range air-to-air missile (WVRAAM). The A-Darter is reportedly a frontrunner for the PAF’s requirement of a HOBS WVRAAM for use on the JF-17. The JF-17 is a modern and cost-effective platform capable of taking on a wide range of critical tasks for the PAF. In the 1990s and 2000s the vast majority of operations would be undertaken by specially-designated and equipped aircraft: F-7P for point defence, A-5 for close air support, and the Mirage III/V for strike and air-to-air engagements. Not only is the JF-17 capable of performing each of those tasks, but it is superior to each of those platforms in performance (be it range, payload, capability of radar and avionics, etc). From being able to effectively defend Pakistani airspace to being capable of inflicting damage on key targets from stand-off ranges over land and sea, the JF-17 is destined to play an indispensable role for not just the Pakistan Air Force, but the Pakistani military at large. zebra7, Upasana debnath, Hellfire and 2 others like this. The dual-seat variant of the JF-17 – the JF-17B – has successfully undertaken its maiden test flight on April 27. Production of the JF-17B prototype began in April 2016; the Pakistan Air Force (PAF) had hoped to induct the JF-17B by this time. Currently, the JF-17B is entering the testing phase. Aviation journalist Alan Warnes reports (via AirForces Monthly) that three JF-17Bs are under production, two of which will join the PAF. Besides having a second seat, the JF-17B exhibits several major design changes to the single-seat JF-17. It has a dorsal spine, possibly for fuel (to compensate for the space taken by the rear-seat). The vertical stabilizer has also been modified; as per Alan Warnes, the swept tail houses components for a new three-axis fly-by-wire flight control system. The nose was also enlarged to accommodate an active electronically-scanned array (AESA) radar, which will be a core subsystem of the forthcoming JF-17 Block-III. 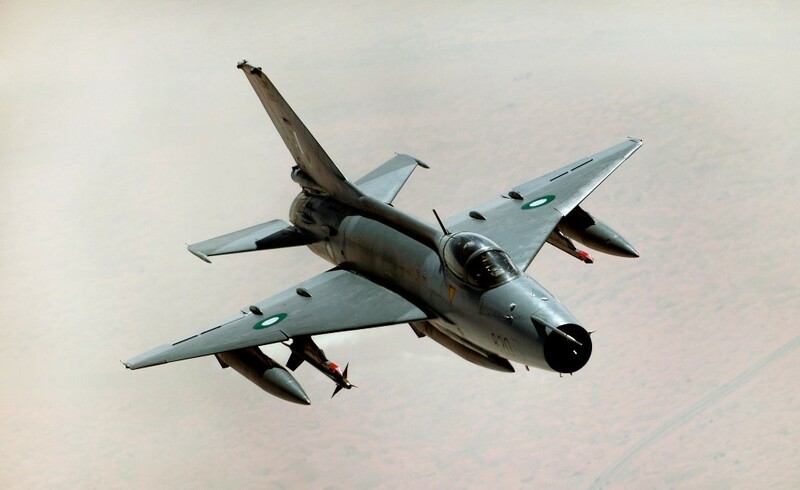 The JF-17B was primarily developed to meet the needs of prospective export users, which called for the type for in-flight evaluation and conversion training. Currently, the PAF is undertaking conversion training using simulators. However, the PAF leadership had hinted that the JF-17B could see use as a lead-in-fighter-trainer (LIFT) platform within its own fleet. With advanced targeting pods and commercially available electronic warfare (EW) jamming pods, the JF-17B could also potentially be deployed as a strike or stand-off EW platform, respectively. The PAF formally inducted its fifth JF-17 unit – i.e. No. 14 squadron – in February with Block-II aircraft, which include aircraft capable of in-flight refuelling. In March, the PAF announced that it successfully integrated a stand-off weapon system to the JF-17. There are more than 70 JF-17s in service with the PAF, and the PAF is expected to place its order for 50 Block-IIIs in 2017. CAC and Pakistan Aeronautical Complex (PAC) have also secured export orders from Myanmar and Nigeria. Evolution of Jf17: Mig21 -> J-7 -> JF-17. This plane ,though being best variant of Mig-21, is still way inferior to F-16, and only pakistani fanbois believe that it adds much in way of capability to PAF. Though it does add numbers. Hellfire and Agent_47 like this. 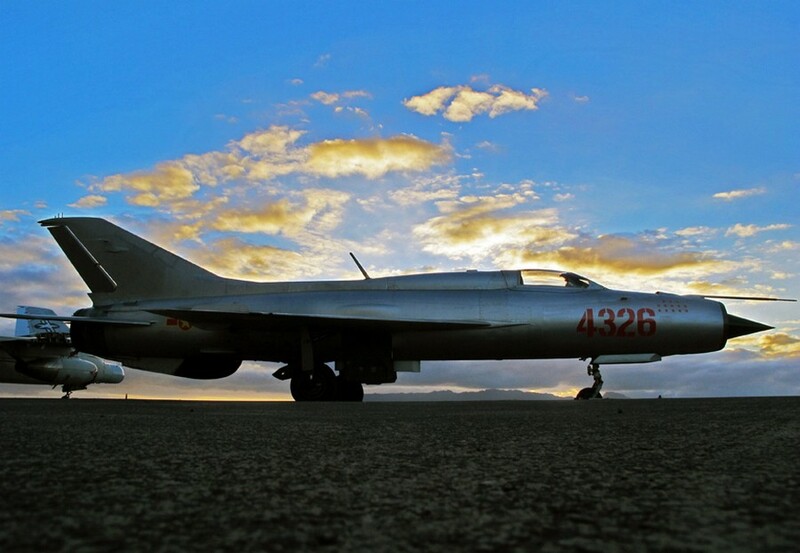 In 1989, the Chinese Chengdu Aerospace Corporation unveiled a major upgrade for its locally-made F-7 jet fighter, a licensed copy of the classic Soviet MiG-21. The new F-7 variant moved the engine air intake from the nose tip to the sides of the fuselage, making room in the nose for a more powerful radar. Twenty-one years later, this upgrade—now named JF-17 Thunder—is flying combat missions with the Pakistani air force, so far its sole user. Further enhanced with a new wing, a cutting-edge intake design and a new, more powerful engine, the JF-17 is Pakistan’s most important front-line fighter—and a remarkable extension of a basic plane design dating back to the 1950s. In essence, the JF-17 is the ultimate MiG-21. In a sector increasingly dominated by American-made stealth fighters, European “canard” planes and variants of the Russian Su-27, the JF-17 is an outlier—a highly evolutionary plane that doesn’t try to be revolutionary. After all, revolutionary is expensive. The Soviet MiG corporation began work on the MiG-21 Fishbed in the early 1950s, an era during which most air forces wanted very fast jet fighters, regardless of the design compromises necessary to achieve high speeds. With a theoretical top speed of Mach 2, the MiG-21 meets that expectation—and also boasts a simple, single-engine layout, good climb performance and decent maneuverability. But the basic MiG-21 has its drawbacks. It’s difficult to control and its canopy provides poor visibility. It carries enough gas for barely an hour of combat flying. And its nose intake precludes the carriage of a large radar. Still, MiG made thousands of Fishbeds for the USSR and client states. Several countries including China acquired licenses to build their own copies. Sixty years later, hundreds of MiG-21s remain in front-line use across Africa, Eastern Europe and Asia. China’s F-7 is a much-improved MiG-21 with better pilot visibility, a locally-produced engine and some Western-made avionics. But the F-7 still suffers from a lack of space in the nose for a bigger and more powerful radar. Hence the 1989 proposal to move the air intake to the fuselage sides. Pakistan had bought F-7s and, in the 1980s, hired the U.S. plane-maker Grumman to work alongside Chengdu in an effort to improve the fighters. But U.S. and European sanctions following China’s Tiananmen Square massacre ended the American-Chinese collaboration. Pakistan, which also struggled with Western sanctions tied to Islamabad’s nuclear tests, took an interest in the modified F-7. Over a decade of work, the side-intake MiG-21 variant evolved into something much more sophisticated: the JF-17. Chinese, Pakistani and Russian engineers added a better wing—similar to the U.S. F-16’s wing—plus so-called “divertless” intakes that work equally well while the plane is flying fast or slow. Russia provided the modern RD-93 engines for the JF-17. And most importantly, the new jet’s roomier nose is big enough for China’s KLJ-7 radar, able to detect and track targets on the ground and in the air. 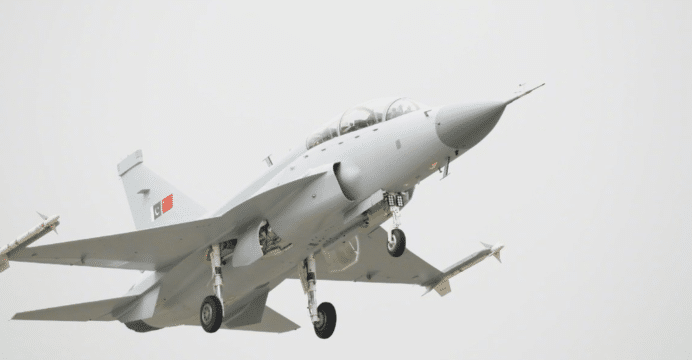 Production began in China in 2006 and soon moved to a facility in Pakistan owned by the Pakistani air force, making the JF-17 the only jet fighter in the world actually manufactured by an air arm, rather than by a private corporation. Islamabad inaugurated the first Thunder squadron in 2010. And that same year, the new jets flew bombing missions targeting suspected terrorists in South Waziristan, part of Pakistan’s restive tribal area. Clearly pleased, Islamabad ordered 150 JF-17s to form the backbone of its air force for the next 30 years. More than 40 are already in service. Priced to move at an estimated $25 million per copy, the JF-17 is possibly the cheapest new-build fighter in the world today. By comparison, each of America’s F-35 stealth fighters costs around $200 million apiece at present—although the F-35 could get less expensive as development continues. The JF-17 is not stealthy. But it does have roughly the same agility as an early-model F-16A, according to Pakistani pilots whom Piet Luijken interviewed for Combat Aircraft magazine. That means the JF-17 is probably a much better close-range dogfighter than the F-35 and many other current jets. Plus, the Thunder can carry some shockingly dangerous weaponry. 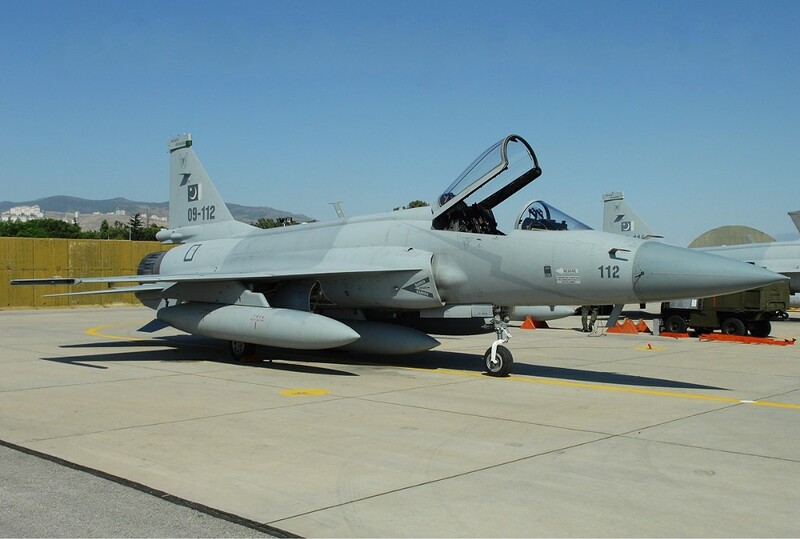 In November 2013, the Pakistanis took the JF-17 on tour in a bid to sell the plane to other air arms. Luijken caught up with the display team during their stopover in Dubai, where he spotted a CM-400AKG anti-ship missile under a JF-17’s wing. The CM-400AKG flies up to 150 miles as fast as Mach 4. China designed the munition specifically to target American aircraft carriers, but it could prove equally devastating to other warships. Pakistan is the first export customer. 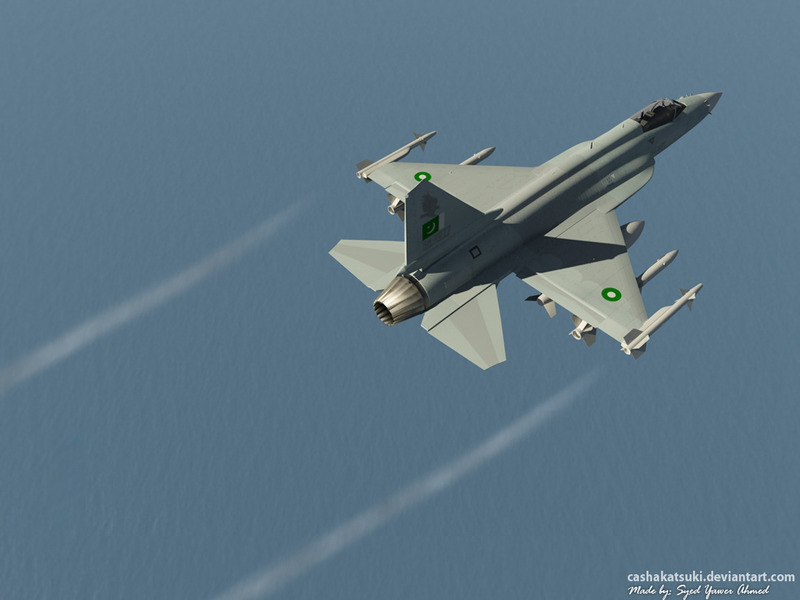 In addition to the CM-400, the JF-17 can carry a wide array of air-to-air and air-to-surface weapons. It might be a descendent of the 60-year-old MiG-21, but the JF-17 is a thoroughly modern warplane—and an affordable one. The same can’t always be said of the F-35 and other current fighters. zebra7, Hellfire and A_poster like this. is still way inferior to F-16, and only pakistani fanbois believe that it adds much in way of capability to PAF. Though it does add numbers. Which shows that you don't really informed yourself about the fighter, nor PAFs F16s. PAF is far more capable today because of JF17 and force multipliers. It offers PAF stand off range PGMs, cruise missiles, anti ship missiles and anti radiation missiles. Most either not available or less capable on their F16s. JF17 is also fully capable to be linked to ZDK AWACS or IL78 tankers, again not possible for their F16. Even the upgrade potential for JF17 is higher, since China provides less limitations on PAF than the US does. In past wars PAF fighters had to cross into Indian airspace to do strikes with bombs. Today they can strike without even leaving their airspace wit stand off weapons. In Kargil we had BVR superiority, today they have AWACS superiority. It might not be the best fighter in a 1 on 1 comparison, but it's very useful for PAF and saves a lot of money. Bregs, Sathya, Hellfire and 1 other person like this. Posting for sake of being contrarian, are we? ZDK AWACS is a third grade product which would not survive 15 minutes in war. This does not come from some fancy propaganda site praising western systems, but from a very basic fact that ZDK AWACS is a propeller plane AWACS, which could not keep up with fighter plane contingent, and could not outmaneuver missile fired at it. Even DRDO AWACS is based on a Emrader ERJ 145 which is twice as fast as Y-8 even after believing Chinese stats which anyway are suspect. That is not coming to radar itself which is way inferior to what we are fielding. Even Pakistanis accept that Saab AWACS (which does not have full 360 coverage and is equivalent of DRDO AWACS) with them are better than Chinese AWACS, even though Saab AWACS are less in number. They do not have AWACS superiority. PAF F-16 could fire Mk80 series bombs which carry kits from Global Industrial and Defence Solutions (GIDS) to convert them into PGMs with range b/w 50-60 Km. PAF JF-17 could fire LS-6 Standoff Precision Guided Glide Bomb with maximum range of 60 Km (folded wing version) when released from altitude of 10,000m. F-16 could fire Harpoon, if Pakistan is willing to pay for them, and Exocet ,if Pakistan is willing to pay for its integration. Both missiles are better than any mouthbreathing Chinese missiles which travel in straight line. Only reason PAF does not have them is because it had brought Exocet for Mirages and did not wanted to pay twice for same capability. Only advantages that JF-17 brings in is promise that China would make up for shortfall of ammunition of JF-17 during an Indo-Pak war. Everything it field, PAF already has better or equivalent with either F-16 or Mirages. And even this advantage is marginal as platform itself does not have any growth potential. It is inferior to even Tejas in design philosophy. I haven't seen any refuelling probe in jf17 so how it can be refuelled with IL 78 tanker. Bregs, Sancho and Hellfire like this. That is due to the avionics. There is nothing more revolutionary in aviation industry than generations upon generations of avionics being integrated. 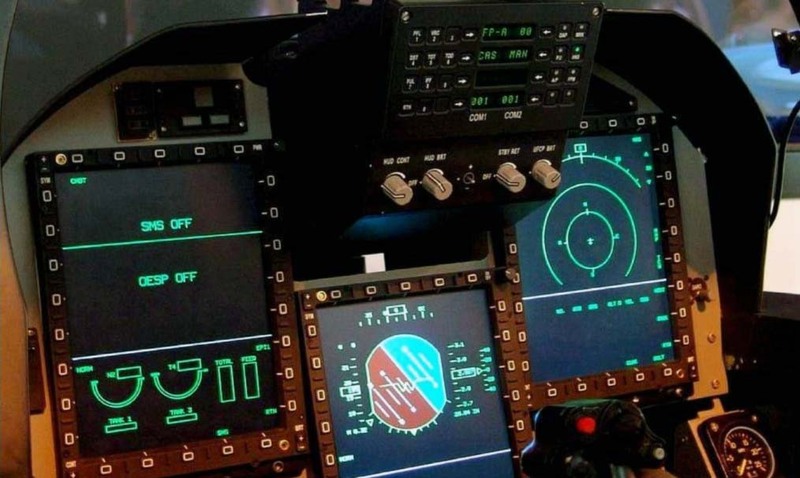 The design philosophy has more or less peaked with the present technological/technical capabilities, the only difference will be the avionics and the tech integration as also ability to control the C3I2 domain in both own and adversarial air space. How about you here? Similar approach? ZDK AWACS is a third grade product which would not survive 15 minutes in war. How did you reach this magical conclusion? Surely, you do not expect to be able to penetrate about 150 kilometers into an enemy airspace 'undetected' and without 'vectoring in' of Interceptors by this third grade product? Or are you pretty sure that your BVRAAM will give a 100% kill inspite and despite ECMs and integrated countermeasures on board, when fired at maximum range? I hope you do realise that at maximum range, the BVRAAM is 'hardly' manoeuverable? This does not come from some fancy propaganda site praising western systems, but from a very basic fact that ZDK AWACS is a propeller plane AWACS, which could not keep up with fighter plane contingent, and could not outmaneuver missile fired at it. See previous rejoinder and ... what are your comments on E-2C? It is, after all, a relative term. They have more than sufficient with sufficient range for their airspace, to maintain a 24x7 vigil. On our side, we will be a bit hard pressed and will need to delegate stuff to Su-30s. Er, Chinese do make perfect rip-offs of the Russian missiles, I hope you are aware. Or are you saying that Russian Equipment is bad? If so, the post becomes contrarian? In overall, I find that Pakistan has managed to meet all it's expectations of it's airforce, looking at the frontage and the airspace it has to defend. Sathya, Sancho, A_poster and 1 other person like this. Not completely true as design philosophy limits the amount and avionics that could be added to an aircraft in a cost effective manner. Most of developments in avionics is towards achieving stealth/low detection rate by enemy. Now if your design is not LO (at least), you would get much less from modern avionics, compared to what a LO deign could. JF-17 is a third generation stable design (the reason why JF-17 does not need FBW) while Tejas is a fourth generation design. This means that unless someone has fucked up pretty bad somewhere in design phase, Tejas would be much more maneuverable than a JF-17. Maneuverability not only helps in dodging missiles, but also helps in not getting targeted in first place. Aircrafts ,as of now, could not fire missiles on input from third party-AWACS or other aircrafts (Meteor is expected to have data link capability, but nothing has that capability as of now), and thus it is Aircraft (which has a very small radar cone) need to detect enemy aircraft. In scanning an area,Aircraft radar uses Low pulse frequency mode in order to cover wider area. When that jet is targeting an enemy aircraft,he has to switches to a high pulse frequency ie lots of 'pings' in less time, which are needed to accurately track a fast moving target.This condition is called "Radar Lock" and in this whole radar assembly is used to just target one, or few targets. In both cases, a more maneuverable aircraft could get out of radar cone of enemy easily. More maneuverability also mean that an aircraft could dive into radar clutter of enemy aircraft. Partially. But overall, I am serious. There is no point in attributing advantages to enemy, where they does not exist and could not exist. There would be no need to penetrate 150 Km for two reasons. (1) In case of a slow moving propeller AWACS, a missile could be fired at close to its maximum range. (2) If Pakistanis need to use their AWACS effectively, they would have to bring it closer to border so that it could look deep into Indian airspace, else they would detect IAF planes quite late, and PAF would get jumped regularly. Here IAF would have advantage as Phalcon is better AWACS than ZDK (Even Pakistan wanted Kj-2000, but China is not giving them on aid) and thus could stay inside India, and Pakistan does not have strategic depth. Not at maximum range, but near maximum range. ECMs could not be predicted as they could spoof even missiles fired at point blank range, but a propeller plane like Y-8 is practically stationary target from a BVRAAM's pov. If a BVRAAM has range of 100Km, it would be effective only upto 30 Km in combat as range is denoted as range at high altitude head on chase, but in real life, targeted plane would use kinetic maneuvers thus reducing kill-zone/effective range of a BVR; but here in case of a propeller/Turbofan driven AWACS, there is not much room for kinetic maneuvers, and you have to depend solely on ECMs. USA has E-3 Sentry radars too, which utilize Boeing 707 as platform. You are comparing a carrier based niche radar with a ground based radar. E-2C is product of its environment as it has to take off from an Aircraft carrier (a Boeing 707 can't) and has weight limitations thus need more fuel efficient platform (Turbofans/propeller planes are more fuel efficient than jets). They have radars which they need to bring within envelop of IAF ,during war, in order for them to be effective. And that too if ZDK is even half decent. Pakistanis ,themselves, admit that ZDK is even inferior to SaaB Erieye, and even SaaB Erieye is not as good as Phalcon. Perfect ripoff is a bridge too far. Since JF-17 is not that good a plane as even F-16, how much would Pakistan get out of its JF planes in case of war against Su-30, Mirage-2000, Mig-29? Since PAF has locked in on a 3++ gen plane as its mainstay, it has exhausted its capacity to upgrade to better platform when India start inducting Rafales as it could not field as numerous an airforce as India. But, the design can not be further revolutionised, is that not correct? You can tweak here and there, the only 'cutting edge advancement' will remain in the avionics and integration? And that is what I have said too! I would re-term it as more of an attempt at achieving a relative stealth configuration, stealth being a 'mirage' as more advances occur in the arena of Air Defence. If you ask any of the SA-6 groups in India (IA has two 501 and 502 AD Groups), they swear by their missile system till date, irrespective of ARMs/ECMs. Avionics predominantly are more segmented to achieve better synchronisation between various assets in Battle Space awareness domain, ease of functioning to reduce pilot fatigue and to provide you with relative advantage in first detection/kill and higher survivability. -17 is a third generation stable design (the reason why JF-17 does not need FBW) while Tejas is a fourth generation design. This means that unless someone has fucked up pretty bad somewhere in design phase, Tejas would be much more maneuverable than a JF-17. A stabilised 3rd Generation with updated avionics and better system integration and situational awareness is still an asset, whereas a hypothetical 4th Generation still being produced is - still far from it! I would not comment on relative merits/de-merits yet. Mig-21 Bis is a formidable fighter, which, still manages to give the AWACS a slip under expert hands. You should listen in on a debrief sometimes of IAFs pilots. With the avionics loaded by Indians on board, I will still bet my money on it. Maneuverability not only helps in dodging missiles, but also helps in not getting targeted in first place. I disagree. In an era of BVR air combat with asymmetric force concentration, you can have the most agile fighter and I will still shoot it down. This is where we have a slight difference in understanding. You are assuming that Pakistan wants to 'look' into Indian Airspace. They are not going to be able to do that for every aircraft. What they have positioned for is to coordinate their own CAPs within their airspace to intercept IAF strike missions. For that, they are ideally placed. While our Phalcons will be looking into Pakistan and catching any aircraft taking off, theirs will be more positioned to report incoming IAF aircrafts as strike missions may be from Gwalior or Bareilly for example and will be out of their range of detection in initial stages. Remember, platforms neutralised is also a victory, even if after the strike mission is successful as it denies platform to IAF. Have you seen an An-32 do an assault landing? You could not be more wrong!!!! A_poster and Sancho like this. Nope, for informing myself on the fighter for years, to understand what IAF is up against and not claiming things from a false superiority point of view. Which you should do as well, before getting to such conclusions. In war times, they have a single border line to cover, with higher numbers of AWACS aircrafts available. That makes them superior, since they can provide early warning capability, covering the whole border area 24/7. IAF has just 3 A50s as of now, which are technologically superior, but too low in numbers to cover the same area the whole time. DRDO's radar system is a good and cost-effective addition, but if you compare detection capabilities, it's below the Erieye system. But the biggest problem is, that IAF has to split it's aircrafts to keep China in check as well. So our already limited AWACS capabilities will be further reduced! That's why IAF is asking for a long time for more AWACS (the requirement is around 15 aircrafts and they have 5 now) and don't want to wait for AWACS India, just as for more tankers, since otherwise supporting 2 fronts is not possible. TSUNAMI, Bregs, A_poster and 1 other person like this. (1) In case of a slow moving propeller AWACS, a missile could be fired at close to its maximum range. First of all you don't fire a missile at maximum range, before you ID'd the target and know what you are shooting at. Secondly, the longer the distance, the more time for the target evade with countermeasures. Not to mention that these high priority targets are protected by escorts and ground defences. So to kill AWACS, IAF has to penetrative enemy airspace, evade ground defences and air defence fighters, before even getting a chance to kill the escorts. All this, while the AWACS sees our fighters first! This shows exactly why the warfare situation has changed, compared to earlier wars, as I explained in my first post. While IAF simply could wait and see in Kargil, to prevent PAF from attacking, they have to be offensive in any future war, to defend the country. Agent_47, Bregs and Hellfire like this. (a) AWACS have a very large RCS and thus they would be easily ID'd. That is not a problem. (b) A prop plane has less potential to evade a missile than a jet plane, that's why I said that a missile could be fired at NEAR maximum range in case of slow moving prop planes (not maximum). (c) Their AWACS would not see our fighters first, If IAF too has AWACS in area. IAF does need more AWACS,but it does not change the fact that PAF AWACS are significantly inferior to IAF AWACS and their best compares to our second tier AWACS (DRDO-AWACS). If you are counting all sundry AWACS in PAF's account, I am sure that even DRDO ones should be counted in IAF's tally.